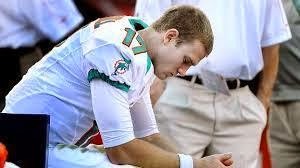 Miami Dolphin Bus Driver (Ryan Tannehill) Runs Self Over. The Miami Dolphins special teams were severely out punted with an astounding hang time and yardage effort by Dustin Colquitt, and the Chiefs had numerous returns of big yardage for naught reversed due to penalties. The penalty match up was lost by the Dolphins with 65 yards to the Chiefs 23 yards, and Kansas City won the time of possession game by seven plus minutes. Miami's defense missed a plethora of drive discouraging tackles while allowing 342 total yards, though only ten more yards than the Chiefs defense allowed. Kansas City superstar running back Jamal Charles was inactive for the game, and their backup Kniles Davis scampered for 132 yards on 32 carries with a touchdown. The Dolphin defense won the turnover battle (2 - 0) with forced fumbles in the 3rd quarter by Jared Odrick, and 4th quarter by Brent Grimes while giving the offense an occasional short field to work with. Jelani Jenkins led the team in tackles with 15, eleven solo, and 1.5 sacks. Miami sacked the Chiefs quarterback five times including a safety for two defensive points while the Dolphin quarterback was sacked on four occasions. The Miami Dolphins play calling was suspiciously questionable on many occasions, and the pass blocking wasn't overly efficient while once again there were numerous dropped balls. Lamar Miller had a good day with 108 yards on 15 carries which one would think would have opened up a productive scoring game through the air. For a third straight week Mike Wallace led the Dolphin receiving corps with 74 yards on five receptions while in this game Brian Hartline had the one Dolphin touchdown reception. However. On this particular day! The Miami Dolphin quarterback Ryan Tannehill failed miserably in connecting on fewer than 50 percent of his 43 attempts for 205 yards at home versus the Kansas City Chiefs. Miami had possession of the ball on fourteen occasions and mounted 332 total yards of offense, at a mere twenty three yard average per possession. Tannehills lone three scoring drives came in succession for a whopping, mind blowing thirteen offensive points. The first was a second quarter ending drive of 74 yards on eight plays in one minute thirty five seconds for a 22 yard Calib Sturgis field goal as time ran out. Earlier in the second quarter Sturgis missed a 48 yard field goal attempt, and Miami went to the tunnel trailing by a score of 14 - 3. On the Chiefs opening third quarter drive, Jared Odrick sacked and forced a fumble by the Kansas City quarterback that was recovered by Derrick Shelby at the oppositions 19 yard line. Four plays and nineteen yards later, Tannehill connected with Brian Hartline for a one yard touchdown and a 10 - 14 deficit. The Chiefs followed with a ten play, 66 yard, five minute touchdown drive for a 21 - 10 lead. Upon the Kansas City kickoff, Miami return man Jarvis Landry gave Ryan Tannehill another golden opportunity with a 74 yard kick return to the Chiefs 33 yard line. Miami went zero yards in 3 plays and kicked a 51 yard field goal to pull within eight points at 13 - 21. Following a three and out for the Chiefs. Miami went 3 and out. On the Miami punt, the Dolphins got a reprieve from a 48 yard Chiefs return after a KC penalty pushed their backs up against their own goal line at the one. The Dolphins were down by eight points with 2:42 remaining in the 3rd quarter. Miami fans throughout the world were screaming, ""give us a safety to pull within six, and give the offense an opportunity for a touchdown drive and a one point lead to end the quarter"". On first and ten Randy Starks and Jelani Jenkins got the sack and safety for a 15 - 21 scoreboard. The game was taking a positive turn. Ryan Tannehill and the Miami Dolphins final five offensive possessions covered a total of eighty two yards with the longest drive being of twenty nine yards and zero points. Kansas City scored two additional touchdowns of the short field variety due to the Miami Dolphins four down territory offensive ineptitude and a final discouraging score of 34 - 15. Thank You for a (Not So) open-minded read, and comments of which you have every right to "On This Particularly Disgraceful Day of the Dolphins quarterback" Ryan Tannehill! Off to London for a road game against the Oakland Raiders.